Two days ago I began to write about the impact of the First World War on one particular family in Barnsley, the Priestleys who mostly lived in the crowded south-east ward of the town, the Wilson's Piece and Barebones areas. Robert Priestley (b.1846) was my OH's 2x great grandfather. By the outbreak of war he was a widower in his late sixties. 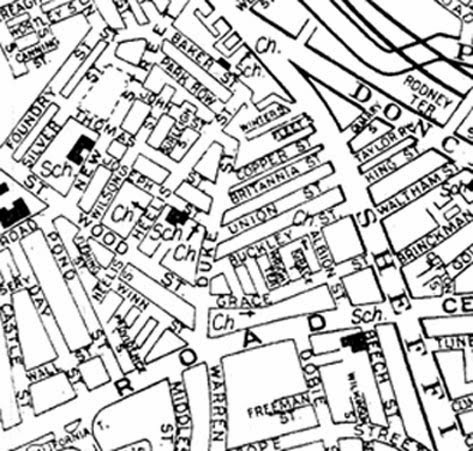 Several of his married children lived near him and two unmarried sons lived with him at 9 Duke Street. I have already discussed his married daughter Frances Mabel Jackson (b.1888); her husband Charles was away from home for practically the whole duration of the war leaving her to support a growing family on a soldier's separation allowance. The next men to enlist were Robert's youngest son, Walter Clarke Priestley and his older brother William. I am lucky to have the service records for both men from the Ancestry website and I can see that Walter enlisted on 2 February 1915 joining the 2nd Barnsley Pals. Note the overlying scrawl 'Killed in Action'. There is a great deal of information and background about the Barnsley Pals in Jon Cooksey's book of the same name. The Barnsley men had heard in December that their battalions were to be designated the 13th and 14th Service Battalions of the York and Lancaster Regiment. Recruitment was slower for the second battalion, which had started on December 9th 1914. When Walter turned up in February he was allocated the number 14/429. The first battalion had recruited over 900 men in three weeks, the second was to take considerably longer to recruit the necessary 1100. Comments were made in the newspapers in January 1914 that half of the men coming forward were married and wondering at the reluctance of the young, single men to enlist. It is possible that Walter enlisted in response to some of this publicity. In the census of 1911 Walter's occupation was given as Bobbin Worker, but by the time of his enlistment he has moved on to be a Glasshand, probably working at Ryland's works at Stairfoot with his brother William. Walter gives his age as 19 years and 139 days, which makes him born on 16th September 1895. However as his birth was registered in the December quarter of 1896, this suggests that Walter exaggerated his age on enlistment. At this time men had to be nineteen years of age to serve overseas. I wonder if he thought of it himself or whether the recruiting officer sent him for a walk around the block to 'add a year to his age' as appears to have been common at the time. Four days later, on Saturday 6th February 1915, older brother William (b.1876) enlists as well. He is assigned regimental number 14/500. William is 37 years old, married with five children and living at 41 Britannia Street, which adjoins Duke Street. Did he enlist with some idea of protecting his little brother? Was he shamed into joining up by Walter, or did Walter's excitement at enlisting rub off on his older brother, who then, despite his age and family responsibilities, walked down to the Public Hall on Eldon Street after he finished work on Saturday afternoon, and signed up. This snip from William's service records shows that he declares in 1917 that he was an experienced Glass Blower and that he had worked at Ryland's Glass for twenty-five years, so since he was a boy himself. This tallies with his occupations as listed on the 1901 and 1911 census returns. This information was being collected to facilitate William's transfer back to civvy street after being wounded. A few weeks later on 23rd February 1915 brother-in-law Arthur Beevers also joins up. He had married Effie Priestley (b.1886) in 1906 and they have three children under ten alive when he enlists. In 1911 he was a Shield Turner at the Bobbin Mill, maybe at the Beevor Works on Pontefract Road but when he enlists he gives his occupation as Labourer. He is assigned regimental number 14/650. The second battalion was housed at the Public Hall and the schoolroom of the Congregational Church on Regent Street at this time. The men had no proper uniforms and were sleeping wherever they could, on the floors, with just a blanket or so. Training took place at Silkstone Camp, about three miles out of town, where the first battalion were based. All changed on 13th May 1915 as both battalions left Barnsley for Penkridge Bank Camp in Staffordshire. Schools were closed for the day so that children could wave goodbye to their fathers. William's wife Clara and his five children, Ann aged 13, Ernest 12, Effie 8, Ida 6 and Fanny aged just 3 would have been amongst the crowds waving off their loved ones as they marched down from the Public Hall to the railway station. 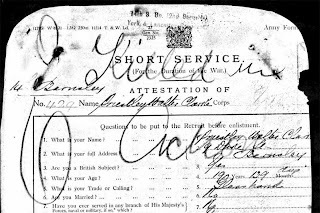 There are no clues in William's service papers, but the date of birth of his sixth child, Eliza, 2 Jun 1916, squeezed in at the bottom of his list of children on the form above, suggests he must have got some leave later that year to visit his family before embarking for the Mediterranean with the rest of the Barnsley Pals in December. Arthur Beevers leaves behind his wife Effie and children Edith aged 8, Alan 4 and Gladys 20 months old. Walter, to whom it was probably all still a great adventure, waves goodbye to his elderly father and oldest brother, Robert jnr aged 41, now the only men of the extended Priestley family left in Barnsley. 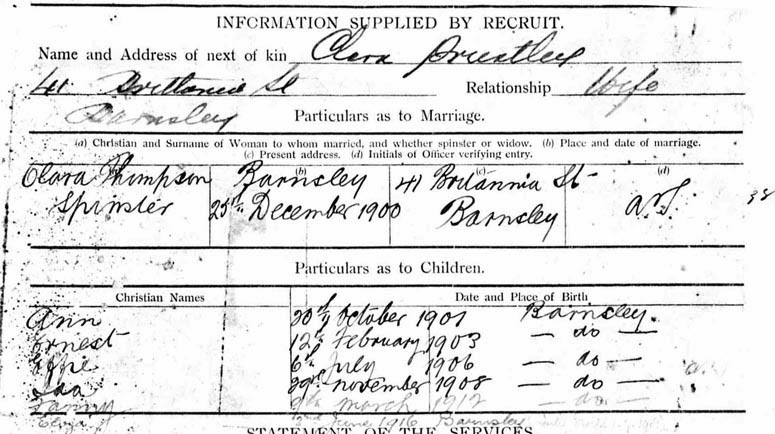 Charles Jackson, who is still at this point with the 1st Barnsley Pals (see my previous post) had a longer march that morning, having to come from Silkstone Camp, and he would have been waved farewell by wife Frances (nee Priestley) son Charles aged 7 and baby Frances, born in February 1915. Duke Street, Barnsley in the 1960s. Britannia Street runs off from just right of centre. I feel I need to qualify the previous paragraph a little - but the facts are a little woolly. Mary Jane Priestley (b.1884) had married Robert Thompson in 1904 but by 1911 is living back at home with her father at 9 Duke Street. Something had gone wrong with her marriage as she was by then pregnant with the first of many illegitimate (in that their father was not her husband) children. Her new partner was Matthew Taylor, a widower who lived across the street at number 8 Duke Street. 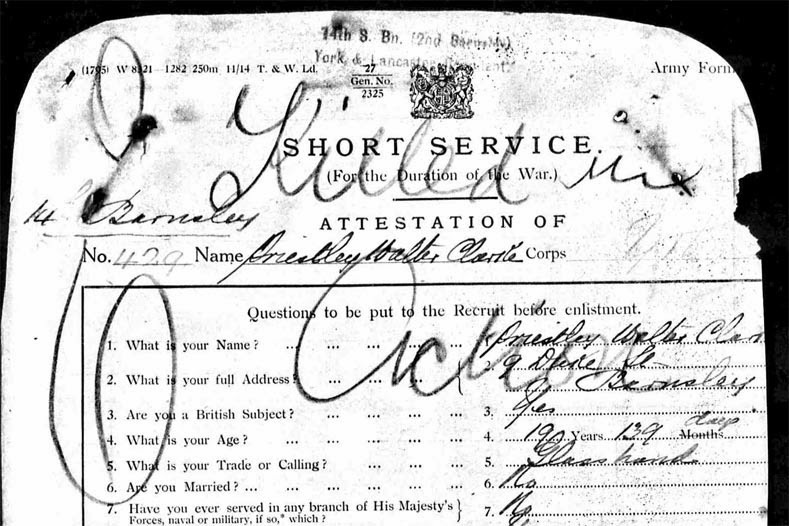 Matthew is 37 years old in 1914 and I can find no evidence that he enlists even after conscription in 1916. He was a Glass Blower like William and had three surviving children in 1911. Did being the sole provider for his children protect him from conscription, could that be a reason why he didn't marry Mary Jane? 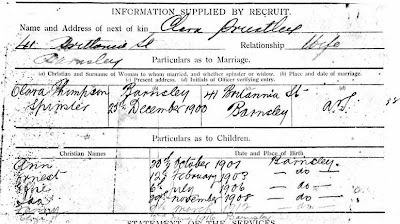 By the time the other Priestley men march off to war Mary Jane appears to have moved in with Matthew as the death of their third child is noted at 8 Duke Street in 1914. I assume a Glass Blower earned a reasonable wage, certainly better than an elderly road labourer like Robert Priestley. So at least one of Robert's daughters still had a man at home during the war, even is she wasn't married to him! 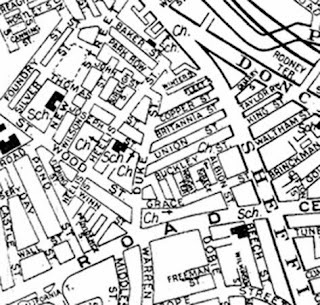 You can see how close the Priestley family lived to each other on the map snip above, 9 Duke Street, home of the Roberts, father and son, is to the left. Across the road is number 8, home of Matthew Taylor and Mary Jane Thompson, still in existence in the 1960's photo above, the house to the right of the shop. 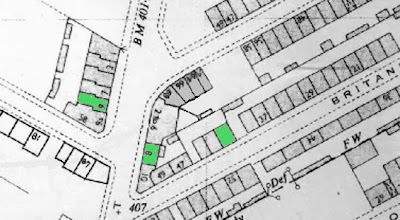 Clara Priestley, wife of William was at 41 Britannia Street, the un-numbered green box to the right and Effie Beevers would have been about 150 yards away at 74 Heelis Street. Hopefully they were support for each other over the next four years. We know the Pals moved from Egypt to France in March 1916 and of course both battalions saw action on the first day of the Battle of the Somme. What would their families have known about their lives? It's at times like this that I wish I had access to the digitised Barnsley Chronicle here at home ... there would be lots and lots of information about life in Barnsley on the Home Front in the papers. The runs of local papers on the British Newspaper Archive online mostly end in the first decade of the 20th century at the moment. I wonder if they are saving the exciting newspapers for launch during the First World War centenary? I'll go into a bit more detail about the Priestley men's service experiences in my next post.